Today we released a new version of fabric8 - version 2.2.51. Well in fact that is no so big news, as we do frequent releases. But I am using this an an excuse to grab a beer and record a video. The video walks you through how to get started deploying and running your Java applications on fabric8, or to be more precise an OpenShift or Kubernetes Platform. The video was recorded as a one take you get to see the few mistakes I do, and as such the videos is about 15 minutes long. 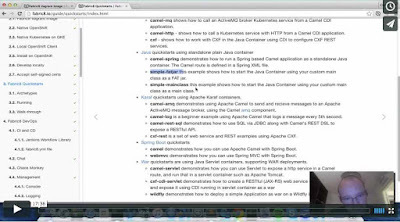 The video is primary using the command shell as the interaction with OpenShift and Kubernetes. This is on purpose to show there is no hidden agenda, and that you can use any kind of tool, or is not locked into using heavy and complex tools. Note the video is demonstrating a simple deployment strategy where we deploy straight to the platform. The fabric8 project has a much more sophisticated story for DevOps and CI/CD. James Strachan and James Rawlings are working hard on this, and are currently recording a new set of videos to show the latest progress in that area. So expect me to point your in their directions where we have more to show. In fact a good source to keep up what happens on fabric8 is to follow fabric8 on medium. Okay back to my videos, which is essential a video recording of our new beginner guide for the most simple quickstart we have with fabric8. And you may never expect to hear from my mouth, but this video is without Camel. There is sadly no Camel in this video. And the reason is that Camel has been a bad animal. I spent hours today chasing a problem with generating a new updated website for fabric8, which after hunt using git insect finally had to come to the reason, that for some reason a Camel upgrade causes a Scala scalate compiler to barf and spit out a 250+ lines long strack-trace that leads you astray. Yeah I guess I got a bit karma in my face for all the Camel users that may have looked at long Camel strack-traces in the earlier releases of 2.x, until we refactored the core and collapsed the strack frames tremendously. Ah okay well before this problem I would have started with the most simple quickstart anyway, which does not include Camel. Stay tuned for more videos and documentation to come together in the near future where we will continue this trend, and look at how to build microservice applications using Camel on the world of docker and kubernetes.